Samsika® Marketing Consultants presents the Annual Samsika Marketing Award for Marketing Excellence in Academics™ for BMS Students. The SAMSIKA BMS awardees pose at SAB academy in Powai. Sitting – Sangeeta Kapoor, Director, Jagdeep Kapoor (Chairman and Managing Director, Samsika)Dr. M. N. Welling (Principal – Narsee Monjee College of Commerce & Economics), Chief Guest, Mrs. Asha Kapoor, Director, SAB TM Mr. Yashpal Kapoor. Senior Consultant, Samsika and Head of the family Front Row- second and third from left Samridt Kapoor(Son), Hansika Kapoor (Daughter) with the MBA winners. Sa m s i k a Mar k e tin g Consultants Pvt. 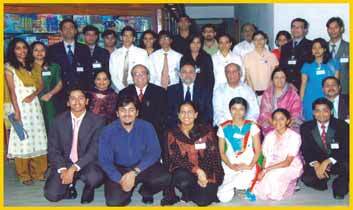 Ltd., the pioneer in strategic Brand and Marketing Consultancy, presented the Eighth Annual All India Samsika Awards for Academic Excellence in Marketing to the Management Institute, for year 2007 - 2008 on 16th March 2008 at the Samsika Academy of Brand Management, Powai. Over the year, Top Management Institute have participated in Annual All India Samsika Awards for Academic Excellence in Marketing, including, the IIMs, - IIM Bangalore, IIM-Kolkata, IIM Kozhikode Jamnalal Bajaj Institute of Management Studies, Xavier Labour Relations Institute Jamshedpur, FMS Delhi, MDI Gurgaon, Symbiosis Institute of Business Management Pune Narsee Monjee Institute of Management Studies Mumbai, IIT School of Management Mumbai and many more. The Chief Guest Dr. M. N. Welling Director Jamnalal Bajaj Institute of Management Studies presented the awards to the best Marketing Minds in Academic all over the country at Samsika Academy of Brand Management. Jagdeep Kapoor, Chairman and Managing Director, Samsika Marketing Consultant felicitated the winners. This award was instituted eight years ago in a pioneering effort for the first time in India. This award aims at encouraging and increasing the involvement of budding, marketing students in the field of Marketing. The best marketing student, for the Eighth Annual All India Samsika Award for Academic Excellence in Marketing was chosen by the Director of the participating Institute, and each award winner was awarded the following: A cash award of Rs. 1,500, The Eighth Annual All India Samsika Award for Academic Excellence in Marketing Trophy, A special certificate from the Samsika Academy of Brand Management (SAB). The students of first year MBA course were eligible to participate in the Samsika A ward for Academic Excellence in Marketing contest The winners were felicitated at an award ceremony held on 16th March 2008. A total of twenty MBAs won the Eighth Annual All India Samsika Awards for Academic Excellence in Marketing for the year 2007 - 2008 from various institutes. Since each Institute's best marketing student was awarded, the competition was healthy and fair. Each recipient appreciated the 'First time in India' effort by Samsika, to recognize and award the marketing students.